When it comes to trading and investing, different strategies are employed to get some amount of success. Different strategies may work or they may not depending on certain situations concerning the market. One of the more intriguing of strategies that some traders and investors use is the averaging down strategy. Averaging down is quite simple to understand, actually. But it is how and when it is being used as a strategy that can make it quite effective. While some consider this strategy as a means to minimize losses as well as get some possible gains in some instances, there are some traders that consider it a useless as well as risky strategy. Here’s how averaging down may work. Suppose you buy a total of 100 shares of a certain stock at $10 each. Disregarding commissions and other fees, you will need to pay $1,000 for the shares. The next day, the stock market experiences a downturn that sees the same stock plunge to $5 per share in the next few days. Form other traders and investors, they would have likely sold their shares before the share price fell to its $5 level. This would have been a good decision in itself as it can minimize possible losses. But the averaging down strategy may work differently. In averaging down, instead of selling your 100 shares, you actually go and buy an additional 100 shares of the same stock at its $5 price level for $500. Averaging down helps bring down the average cost substantially. By buying an additional 100 shares at $5 dollars each, the stock trader or investor can reduce the loss it is supposed to make, on paper at least. You would stand to lose only $2.5 if you sell your total stocks at $5 instead of losing $5 selling your stocks at the same price. But if in case you continue to hold on to the shares and the stock price goes up, you stand to leverage your gains at a better position, based on the averages. It is possible to double up the gains on a stock position by using averaging down as a strategy. But along with its advantages, using the averaging down strategy may also come with its risks and disadvantages. 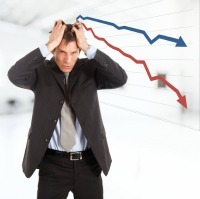 Averaging down may only work if the stock bought eventually recovers and goes up in price. But if the share price continues on its decline, losses are further magnified. In essence, the averaging down strategy may only be used on a selective basis and not be considered as a general strategy for all stocks in your portfolio. Careful consideration should be made whether to use averaging down on stocks that are posed for a rebound after a temporary decline in share prices. But this, in itself can be the challenge that both traders and investors should be facing in a very unpredictable market.